Twenty years ago the Americans with Disabilities Act was enacted by the U.S. Congress. Without the law’s enactment my husband, who had recently become dependent on a wheel chair, would have been unable to go out to lunch, go to church, go shopping or enter a number of buildings. Without the help of ramps, curb cuts and building accessibility he would have been home bound. Disability is defined by the ADA as “a physical or mental impairment that substantially limits a major life activity.” The four goals for public policy for people with disabilities were defined as equality of opportunity, full participation, independent living and economic self-sufficiency. As Public Law 94 142 was designed to provide “free and equal public education” to all children, the ADA expands equal rights to people of all ages. We have grown accustomed to interpreters for those with hearing impairments, braille instructions on elevators and designated parking areas for those with physical disabilities. However, it appears that we are falling short of the stated goals when we look at the poverty rates, unemployment and underemployment figures, and lack of access to cutting edge technologies. President Obama marked Monday’s 20th anniversary of this landmark anti-discrimination law for people with disabilities by promising to boost government efforts at recruiting, hiring and retaining people with physical and mental limitations. The president’s White House adviser on disability policy said advances in technology make revisiting the law a necessity. In future blogs we will look at various needs and opportunities in housing, employment, and full participation. We welcome your questions, suggestions, and comments. Have you, or someone you know, experienced discrimination in the workplace, housing accommodations, or participation in normal activities? The designated month to celebrate National Disability Employment Awareness is over today. The concept is a growing one and will continue to attract attention from employers, employees, parents, advocates and the community. As Ed Moore stated, the community is vital to the acceptance of people with disabilities in the work place. 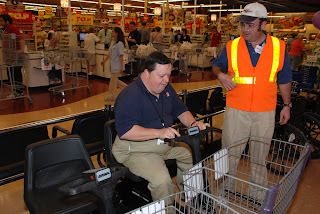 In watching Billy at work for the past eight years, I have seen him and other employees with disabilities interact with the customers who frequent Food City. Since Billy’s disability is quite visible, people sometimes look at him with curiosity or even turn away. That has changed. Now you can hear “Hi, Billy!” as they enter the store, and frequently engage him in conversation. When he and I go to the mall and other places, we continue to hear such greetings addressed to him (I know fewer people than he does). This community acceptance is critical to the achievement of full participation. Another vital component is the responsibility of parents and other advocates. If we want people with disabilities to be a part of the community, it is important that we help them acquire the skills necessary to do the job required. They have to be dependable, courteous, and willing to work hard. They also have to learn that all people will not treat them kindly; this happens to everyone. Several times customers have been rude to Billy. Sometimes he is deeply hurt and has been told by his supervisor to go outside for a while. I am convinced that as expectations and opportunities continue to develop, full participation will occur. All of us are part of the process and the outcome.